As a freelance web designer, I like to work at coffee shops during the day instead doing all my work in my home office. My IKEA desk set is a nice work space, but there’s something about being outside of my home that spurs me to work. Getting started is always the hardest part of the day for me. I put off checking my email and digging into the day’s problems as long as possible, but once I get started I build momentum which carries through the rest of the day. Getting out of the house gets me started. I typically spend 2-3 hours at a coffee shop and then come back home to finish the work day there. My monthly coffee bill is cheaper than renting a co-working space, and I actually have a coffee budget for the month which I keep track of. Honestly, I feel like I’m paying the coffee shop for their electricity, wi-fi, and desk space and they provide me with a free drink as a bonus. I’ve thought about writing off my coffee expense on my taxes, but I haven’t, mostly because when I have that conversation in my head with an IRS auditor he laughs at me and charges me back taxes. After years of experience, I’ve perfected the necessary survival gear required when I work outside of the home. Here are the bare necessities you’ll need if you decide to make a coffee shop your second office. A backpack or messenger bag with several pockets to store stuff is a must-have. Get something sturdy and fairly waterproof in case you get stuck in the rain. I’m not sure how much I paid for this backpack, but it was worth every penny because I’ve had it for 12 years and it’s still in one piece. It’s survived college, three corporate jobs, and three years of freelancing. 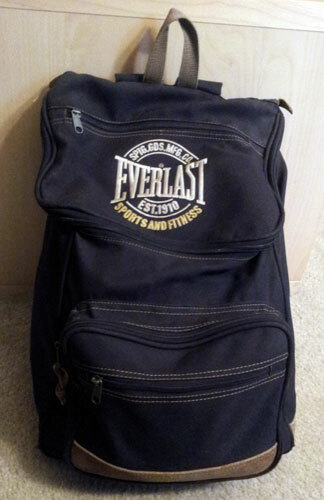 They’re not kidding when they say it’s “Everlast.” I prefer a backpack because it leaves my hands free to carry coffee back to my seat. It pretty much goes without saying that you’ll need to bring a laptop or tablet computer. 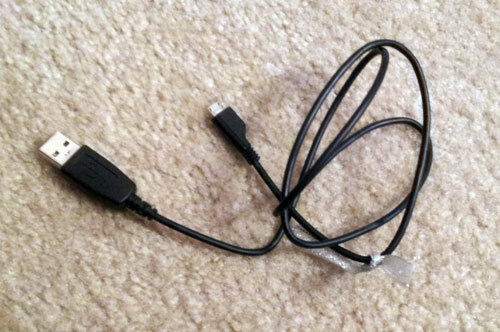 Don’t forget your power cord in case your battery runs low. I recommend fully charging your computer before leaving the house in case the other coffee shop patrons are hogging all the electric outlets. It will give you time to sit and stalk until someone unplugs, giving you the chance to pounce on their vacated seat. 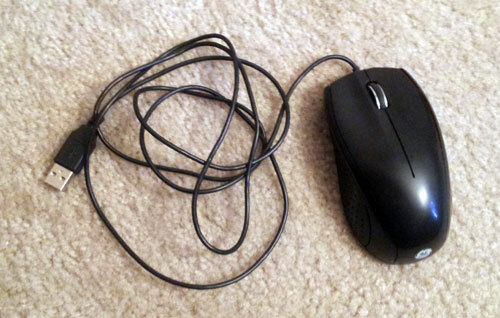 I do a lot of design work, so I prefer to use a mouse. It’s easier and more precise to use than a touch pad. A mouse only costs about $10, so it’s easier to buy one just for your coffee shop kit instead of using the same one at home and on the go. Protect the aural sanctity of your workspace. Bring headphones! They will prevent you from being forced to listen to inane conversations or whatever CD Starbucks is selling this month. They also ward off small-talkers who would distract you when you have work to get done. 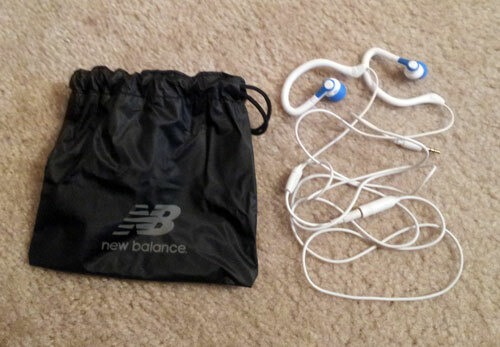 I have a little bag to store my ear buds in so they don’t get tangled up with anything else. The temperature inside a coffee shop varies widely. Sometimes they’ve been steaming enough milk to make the place a sauna. Sometimes the air conditioning is cranked up to frozen mocha levels. Bring a sweater or hoodie so you can stay warm. 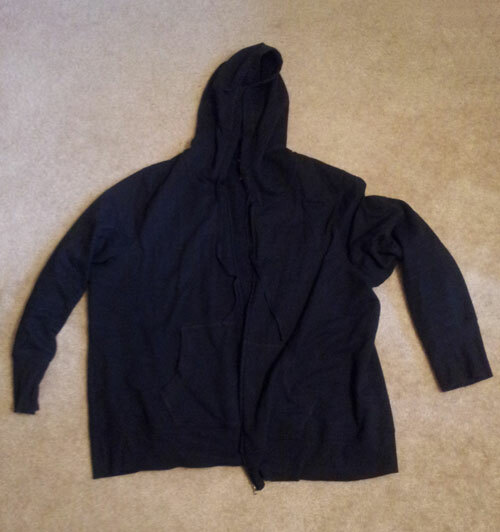 I prefer a hoodie because it offers additional protection if you have to run through the rain to your car. Be warned though, any garments you keep in your coffee shop survival kit will reek of coffee so strongly that people will think you work at a roast house. 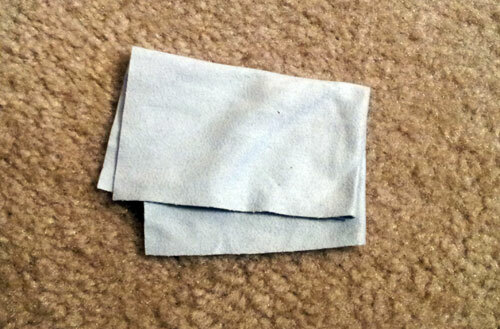 For similar reasons, it’s good to keep a pair of wrist warmers fingerless gloves with you. If you’re working on a computer your hands are away from your body so they’ll get colder quicker than the rest of you. 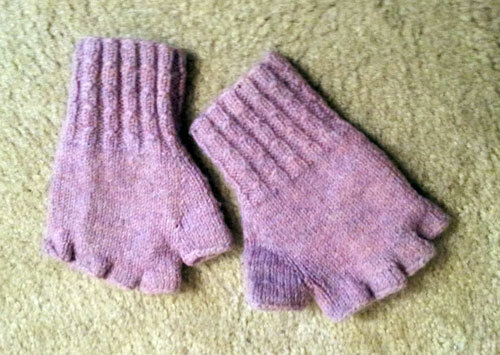 These wrist warmers fingerless gloves were knitted by the fabulous Debbi at Knit. Run. Reap. Eat. 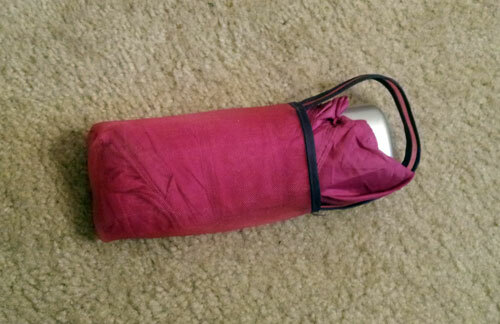 Just in case the hoodie is not enough, I keep a small umbrella in my backpack for when there are torrential rains. Keep this handy to wipe that dust off your computer that you only see when the light hits it in a particular way at that one coffee shop. I keep a USB cord handy in case I need to copy photos from my phone to my computer. It also lets me tether my phone to my laptop to use it as an internet connection if the wi-fi goes down. There’s something intensely satisfying about staying online when everyone else in the coffee shop is refreshing their browsers to no avail. I tie a ribbon around the cord so it’s easier to find when I’m searching through my backpack. If you keep more than one cord with you, tie different colored ribbons around them and they’ll be easier to differentiate. There you go! Those are the essential items I bring with me whenever I work at a coffee shop. One item your might also consider bringing is a power strip. It allows you to plug in if all the electric outlets are otherwise full, but might lead to awkwardness when you need to leave and other people are plugged into your strip. Be sure to put your name on it so no one thinks you’re stealing. Oh, and also bring cash so you can buy some actual coffee. Later: And they just give us candy? Good point about “renting” space by buying coffee. And smart to have everything packed up in a kit so it’s grab and go. I have a similar strategy for my gym and swim bags. It cuts down on procrastination. That ribbon trick is simple genius. And now I’m off to look at Knit. Run. Reap. Eat. Good advice! And wrist warmers are exactly what I need (in my actual office). Love this! I’m a real estate agent & work from home most days because of the cubicle life at the office. I’ve debated my local Starbucks for a change of pace, but haven’t due to fear of forgetting something or being the “newbie” there. I’ve always wanted to do this (I’m a freelance fiction editor) but I am quite short and tables at coffee shops are always too high for me to comfortably type at. Maybe I need to have a booster cushion as part of my pack? Hmm, a backpack that doubles as a booster cushion? Really, really great advice, Jennette! I think I need to do this for the days I can’t get rolling. Not that I’m in coffee house mecca or anything (the closest coffee house is a good 16 miles), but there are days that being home just seems to stymie my motivation. Great post! I am working from home now and some days are hard. Also, right as it’s getting cold in the midwest, I’m concerned about my increased heating costs, my own coffee costs (Kuerig coffee), and how sometimes I’m distracted by the dog or neighborhood. Panera is a good place to! Except for lunch time. Thanks for the shout-out, Jennette. Looks like those have held up nicely. I’m headed your way, hope we can have that cup of coffee Saturday. @Shirley @ gfe – Oh, you’re right! They are fingerless gloves. I’m not sure why I called them wrist warmers. PS – Will respond to your work email soon. This may be the nth time you are asked this, but what model is that computer you use? I am debating to get a Thinkpad Edge to be more mobile (my 6year old laptop wants to be retired badly). And of course, what are you happy/unhappy with about the computer? 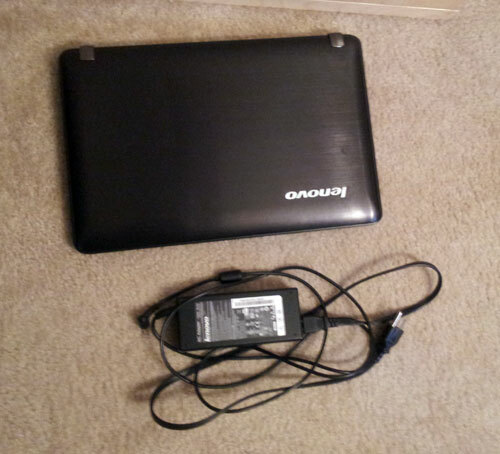 @Chris – I have a Lenovo IdeaPad Y560p with an Intel Core i7 2GZ chip, 6GB memory, and 750mb hard drive. I’ve had it for one and a half years and I’d give it a B grade overall. It’s fast and has several USB ports and a memory card slot that makes it easy to copy camera photos. And I love the big hard drive which allows me to store my entire music collection on the computer instead of on an external drive. On the down side, it gets REALLY hot on the left side and if you have NUM LOCK on nine letter keys become a number pad (UIO,JKL,M<>) which annoys me to no end. It was also missing a screw on delivery, so the hard drive slid out of the connector slot and made it seem like the computer had had a major failure after I’d moved all my stuff onto it, which nearly gave me a heart attack. @JenFul – hey thanks for the info. I love reading your blog, though this was the first time I commented. I discovered Your PastaQueen-Blog last year, a week before my master-thesis-deadline. Oh well, lets just say, PastaQueen kept my stress at bay, haha. If I can be the curmomngon in the room I would like to add my 2 cents. Please, on behalf of those of us who go to coffee shops for a nice hot cuppa to relax for an hour or have a chat with a friend, if you are working with a laptop or other computer please use a table and not the good lounging chairs? Please, pretty please? There is a Starbucks I go to that have three people who camp out in the lounge chairs with their laptops for 3-4 hours a day. And it is not as if they are working together. And there are two big tables for the use by groups. I don’t even see how that would be comfortable. Most of the tables even have plugs next to them. So please, be considerate of those of us who are just there for a coffee break and would like a comfy chair. Thanks, rant over now. With all the talk of protection from the rain, am I right in thinking you got an arm of Sandy over you? Like at the time you were writing this? This list is so true. I once was working at a coffee place with my laptop and my earphones were pretty obviously in my ears. A man came up to me and started trying to talk, and I made it a point to take off one of the buds, smile and very nicely told him that I was busy and had a lot of work to do. I put the ear bud back on, and the guy just stood there, then started talking again. I kept trying to be nice and firm, then resorted to ignoring him. His reaction? He took his finger and started to slowly close my laptop. I bitched him out so bad that he finally got scared and left.